next-Fe/Mn is much more than the next generation of media. It represents a leap of such magnitude that it warrants the label “disruptive technology”. 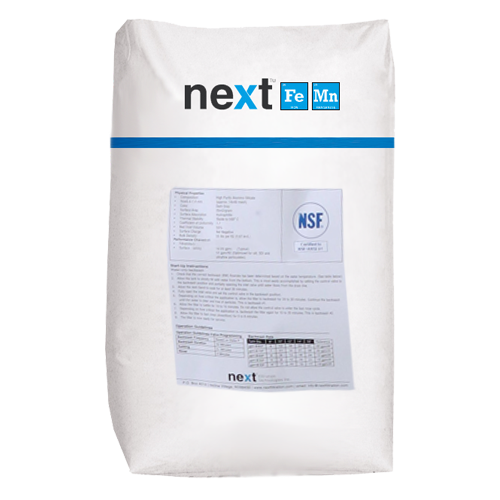 The application of an entirely new science, nanotechnology, is responsible for the extraordinary capabilities of next-Fe/Mn. Atomic Level “Nano-templates” on the surface of small ceramic-polymer spheres transform dissolved Fe++ and Mn++ to the precipitated particulate form which can then be removed by conventional filtration. Absolutely no oxidizing agents, chemicals or oxygen are required and its efficiency and effectiveness is not affected by pH or temerature. Unbelievably fast and efficient – Typically less than 5 seconds contact time is required to precipitate Fe and Mn regardless of teh concentration. In contrast, oxidation and catalytic processes require a contact time of 5-10 minutes. Service Flow – Up to 100gpm/ft2 (800m3/h/m3). In contrast, oxidation and catalytic processes limit service flows to less than 2gpm/ft2 (16m3/h/m3). No oxidizing agents, chemicals or oxygen required. Field proven in over 750 installations. Small systems can incorporate next-Fe/Mn and filtration in a single tank. Operates in downflow mode with periodic backwash. * See next-Fe/Mn application sheet for filter design and construction parameters.